How to keep Windows 100% malware free - 5 steps guide! Blogs > How to keep Windows 100% malware free – 5 steps guide! How to keep Windows 100% malware free – 5 steps guide! The key to keep your computer malware free is at the tip of your fingers. You don’t need expert knowledge or special training.You just need vigilance to avoid downloading and installing anything you do not understand or trust, no matter how tempting might be! In this article you will find 5 tips on how to easily avoid getting your computer infected with malware. If you follow them and we can guarantee that you’ll never have to deal with an infected machine ever again. 1. 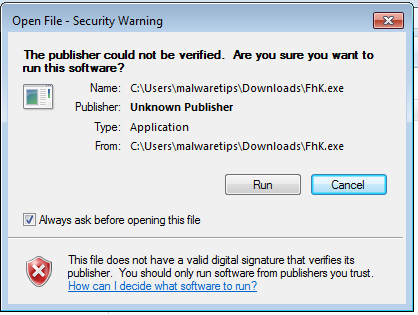 Avoid running programs that where downloaded from a untrustworthy source or don’t have a digital signature. Before clicking the ‘Run‘ button make sure you know what the program is and always keep in mind from where you got it. Everyone has seen this type of alert however most of the user for a reason or another, decide to ignore it and allow the file to run without any kind of restriction. Files that don’t have a digital signature or were downloaded from a unknown source should always be treated as dangerous. Scan it with your antivirus. Scan it with an on-demad scanner (programs that you can install on your computer and use them only for scans) like HitmanPro or Malwarebytes Anti-Malware. Submit the file to virustotal.com,a site which will scan your program with the 43 known antivirus engines. Even so it’s strongly recommended that you run the file in a virtual environment like Sandboxie or Bufferzone until you can decide if the file is malicious or not. Keygen , cracks and patches are the most common ways of getting your PC infected. I strongly advise you to avoid them, as there is little quality control in the world of illegal software, and it is easy for an attacker to name a piece of malware after a popular movie, album, or program to tempt you into downloading it. 3. Download files only from trusted sources. You can drastically reduce the risk of an infection by knowing what and from where you are downloading a file. We recommend that you install a site advisor like Web of Trust or Norton Safe Web, which will help you decide if the site is trustworthy or not. 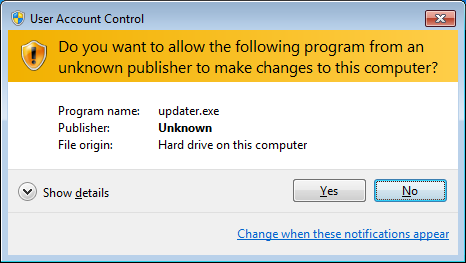 As a general rule it’s recommended that you download files from known and reputable sites that have confirmed that the download is malware free. If you are unsure about the quality of a download, leave the site and research the software you are being asked to install. If it is OK, you can always come back to site and install it. If it is not OK, you will avoid a malware headache. Finding something on the internet does not guarantee that it is true. Anyone can publish information online, so before accepting a statement as fact or taking action, verify that the source is reliable. If it’s sounds to good to be truth then most likely is! You’ll not win the lottery and you’ll not get an amazing prize on the Internet so don’t fall for this type of scams. Ignore emails or websites who promise you a great prize as there is always a catch behind this type of promises. Completing a survey will not grant you a iPhone or 1000$ instead it will give the cyber criminals your personal details. Always update your OS or software when an update is available as this can greatly reduce the chances of an exploit. Also keep in mind that a simple antivirus engine doesn’t do the job anymore, you need to have a layered system protection as malware threats are constantly changing and improving thus making the antivirus engine obsolete. An antivirus, firewall, host intrusion prevention system, a site advisory and sandbox are security layers which every computer needs to be safe in today’s world. You can build up your malware defenses with our help by starting a thread in our Security Configuration Wizard forum. Another common mistake made by Windows users is to disable the User Account Control. The way Microsoft found to keep security, comfort and function in balance by integrating User Account Control (UAC) that seamlessly, is one of the benefits Windows offers.When using a Limited/Standard User Account, your user profile might still getting compromised, but not the Windows basic operating system in the background. Even your profile got hit, all your pictures, MP3 files or documents can be restored easily by logging in to another account that is not yet compromised. I strongly advise you to let this Windows feature enabled and pay a very close attention to this pop-ups, as this could save your computer from an infection. Uninstall Java if you don’t really need it as this is one of the most exploited programs. Don’t give out your details to people who don’t have a legitimate need to know them. While on social networks it’s best to be reserved when allowing people to see your profile or updates.